John Kenny worked as an astronomer, short order cook, animal trainer, cab driver and radio host before becoming a firefighter in 1989. It was perhaps karma, having accidently accidentally set fire to his parents’ house when he was seventeen. His family is grateful that John finally found steady employment and that he has not tried to cook homemade French fries since. John lives outside Ottawa, Canada with his wife Liz and their fur children. The Spark is his first novel. 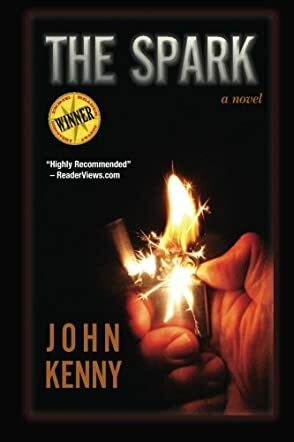 The Spark by John Kenny is set in the aftermath of a fire which claimed the life of one firefighter and left another, Donny, in critical condition. Slightly over a year later, Donny returns to work, doing the same thing as before, putting out fires and saving lives. He still thinks that the fire that killed his captain and mentor was not an accident; there were way too many coincidences for his liking. He decides he will not rest until he finds out the truth so he starts digging, looking over reports, speaking to witnesses, and making calls. There is, however, someone on the other side who will do anything to ensure that the truth never sees the light of day, and she has help from powerful people who can call in favors from as high up as the NSA. But Donny is determined to get to the bottom of it and will not stop, no matter what. The Spark portrays the life of the men and women of the fire department. It has interesting details of the inner workings of the fire department and the tough love that keeps the teams together. John Kenny shares in deep detail the day-to-day life inside the fire department, while at the same time unfolding an enticing and fast paced thriller about a man willing to go to any lengths to discover the truth about the fire that killed his boss and mentor. I learnt so much about the fire department and got to appreciate firefighters even more for putting their lives on the line all the time, while at the same time enjoying an incredible story. I loved every single page of it and read it nonstop to the very end. The Spark by John Kenny is a mystery/thriller novel. Donny Robertson, a fire-fighter, along with his captain Paul Fitzgerald, are called to a douse the flames for a routine job, or so they think - until Fitz dies in the flames. When another body is also found there, it is termed an unfortunate accident. But when Donny begins to investigate, he finds out more about what seems to be deliberate arson. Finding the truth, however, might just make him the assassin's next target and might cost him his own life. This novel is named “The Spark” after its namesake, the assassin hired to murder Youssef Aziz - the person who was killed in the fire. The Spark contains just the right amount of intrigue, mystery, action, and suspense to make it a wonderful read. John Kenny knows how to hold reader attention indeed. This book also describes the day-to-day life of a fire-fighter - the friendship and trust between them, and the lives of the people involved in fire-service. Before reading this book, I had never realized the dangers these fire-fighters, who risk their lives to save ours, endure and the challenges they face. The characters and descriptions in The Spark were sometimes humorous, and sometimes insightful. John Kenny shows his understanding of human beings, by the wonderful portrayal of differences in the way each person thinks and the differences in characters of the people. This book seamlessly blends the mystery and suspense part of the story with portraying the life of fire-fighters. This was one novel I really enjoyed!